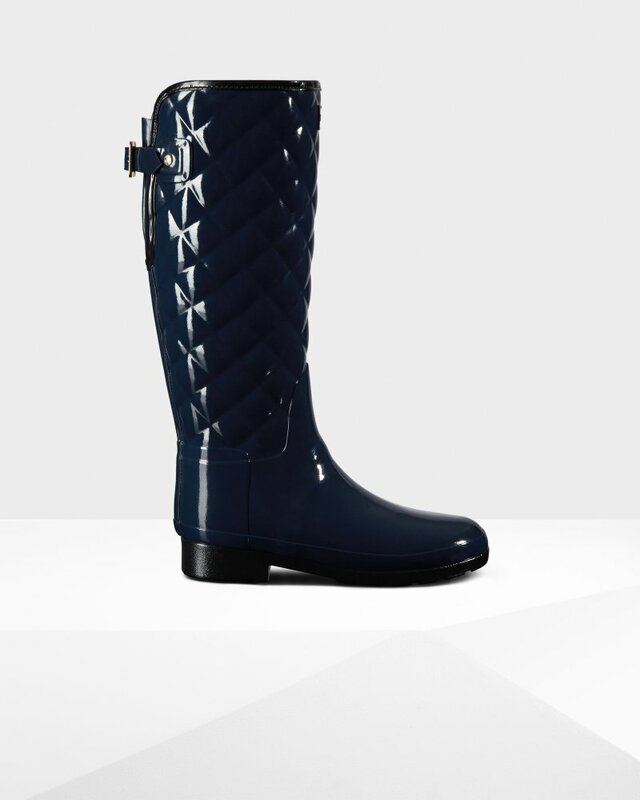 Women's Original Refined Quilted Gloss Rain Boots is rated 4.5 out of 5 by 67. Una versión con ajuste ceñido de la icónica bota Original, cuenta con un nuevo diseño de los aspectos clave para crear una silueta refinada. Un clásico actualizado, este modelo incluye una parte superior de caucho natural acolchado con un acabado brillante. Rated 5 out of 5 by lllucy333 from Perfect boots for WA These are true to size, I'm a AU size 6 and 37 fits me perfectly. Very soft and light, easy to put on, and should be warm enough for the raining season. Glad I ordered the plum colour cause it goes with everything! Rated 2 out of 5 by Caros Corral from Cute but developed multiple "cracks" Loved this boots when they arrived. And they looked sturdy and fashionable. And they were for six months. At the seventh month multiple thin cracks appeared almost like someone had taken a knife to them. But no one had. I wore them lightly to the barn and did not ride in them. HUNTER does not replace for cracks apparently. These might last longer if you only wore them for weekend coffee. But I am searching for fashionable barn boots that I can wear in mud that last more than six months. Rated 5 out of 5 by Plunky from Attractive yet Practical Boot Esthetically - this is a really beautiful boot. The quilted pattern is a gorgeous feature I love. The belt on the back for custom sizing is also very nice as it has a beautiful gold buckle and small gold decorative button which makes this rain boot look even classier. Material - this is a solid boot. Very sturdy, thick material with very thick boot walls and soles. This makes these warm and of course water-proof. They are pretty heavy boots (which could be a con to some) due to the thick material and rubber, but this makes the price feel as though you are paying for a nice, durable item. Fit - length wise I feel these to be pretty true to size. If you run a little on the larger side of your shoe size, you may want to bump up a size though. I can see these running a little on the small side. For the width, I would say these are very narrow shoes. I have very skinny ankles and extremely narrow feet and these feel pretty snug on me in a slightly too snug kind of way almost. They work for me but any more tight and I could not handle them. Comfort - for your average person, these would be/are very comfortable boots. Nice footbed. However, for someone like me who deals with foot pain and plantar fasciatis at times, they aren't going to provide you the support that you need. I often wear these to work where I have a desk job. So I am not on my feet much. And even on these days in these boots, my feet begin hurting fairly quickly. I have worn these all day before to the store and around town and was in pretty good pain by the end of the day. Again, this is due strictly to my foot issues. It's just something to keep in mind if you have foot pain problems. The heel portion of the insoles feel extremely firm to my feet and this insole slopes upwards at the back which I believe enforces more pressure into my heels and causes me more pain. For any regular, pain-free feet out there, I am sure these would feel quite lovely on your feet. All in all, a gorgeous, well made boot. I would just recommend these not be shoes you do miles of walking in if you have plantar fasciatis and foot pain because despite the feature of the "molded footbed", these are not comfort-branded shoes to support weary feet. Despite this, I do love these boots and am very happy with my purchase. They serve their purpose and very stylishly. Rated 5 out of 5 by Quel26 from Great looking rain boots and comfortable too! These boots are so gorgeous, I couldn’t wait for it to rain! The slim fit with adjustable calf buckle makes for a stylish look, and a very comfortable fit. Rated 5 out of 5 by Allison B from Stylish and functional! These boots are great for snow and rain. I just wear a thicker sock on cold days. They look great too. I am typically a size 8.5 so I bought the 9. They fit great. I feel they run true to size. Rated 3 out of 5 by Angie from Great if you have skinny calves. I chose this because I thought it was stylish enough to wear as regular boots at work so I don’t have to take it off on rainy days. The footbed is definitely comfortably cushioned. The discomfort: because of its quilting, the boot gets pushed in or folds right onto the front side of my ankle, on both feet! I’d have to pad that area so it doesn’t hurt so much. Two other wishes: 1) that the adjustable straps were longer to give me more room for my 16” calves, 2) the height of the back adjustment was the same as the traditional back-adjustable boot (tried one on and it was way more comfortable), and 3) the original red and white Hunter tag was on the front. I’m jealous of you skinny-calved chics because your boot options are wide open. BTW, I’m a 7.5 and sized up to an 8. As reference, I’m 5’ 1” and the boots go all the way up to the bottom of my knee.